Marsh Fritillary. Image by Andrew Cockroft. Its been an unusually slow start this year in Yorkshire with the cold North east winds which have blown throughout April and May keeping every thing on hold. Whilst there have been some butterflies the numbers have been very low and this can also be said for most moth species. At last we can look forward to the season in front of us and hopefully a hot and long summer which lasts well into October! Most of the common garden species can be seen in June, Peacock, Comma, Small Tortoiseshell, Small, Green Veined and Large Whites, Orange Tip, Wall Brown, Meadow Brown and Holly Blue should be present searching out nectar bearing plants, we should also start seeing migrant Painted Ladys and Red Admirals in our gardens any time now and if its a good year for migrants maybe a Humming Bird Hawkmoth. On the local moors Green Hairstreaks are at the height of their flight period and Small Heath can be seen on the moorland edges. Late June and early July are the best time of the year to catch up with the rare Mountain Ringlet, which can only be found in high mountain grasslands in a few places in the Lake District and in Scotland; however, it is often abundant when it does occur – why not get out and try and see them? The White Admiral also emerges at the end of the month and can be seen in large woods in Hampshire,Sussex and Surrey. 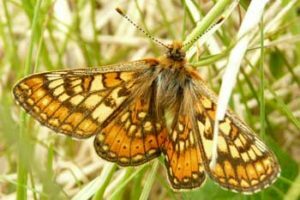 Its is also the peak time for the beautiful Marsh Fritillary, which favours wet grassland in Cornwall, Devon and Kent and the rapidly declining High Brown Fritillary with its preference for violets in woodland clearings in the southern Lake District and the Malverns. N.B. For the young butterfly enthusiasts out there, the last breeding British species of butterfly ‘the Black Hairstreak’ was found by a school boy W.F. Burrows in Bernwood Forest Hell’s Coppice in the early 1900’s. No one believed him at the time until Oxford’s professional entomologists mounted an expedition to the forest and found the species and credited him with the find. Your not likely to find a new breeding species for Britain but you may certainly find a new species for your local area even now – so get out there and have a look! Black hairstreaks are confined to a small areas of blackthorn in the area between Peterborough and Oxford and are on the wing at the end of the month. 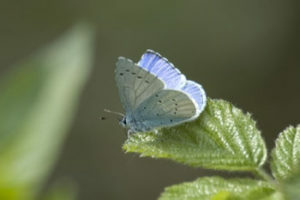 If you would like to find out more about the Butterfly species in the UK go to http://www.butterfly-conservation.org/. 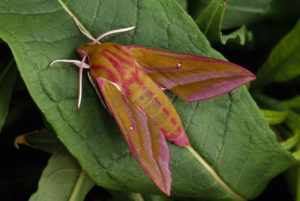 Elephant Hawk Moth. Image by Laurie Campbell. There are plenty of common garden moths to be found in June and a look in your greenhouse/garage or around one of your security/outside lights in the early evening should produce at least a couple of the following – Brimstone Moth, Pale Shouldered Brocade, Spectacle, Ingrailed Clay, Bright Line Brown Eye, Small Magpie, White Ermine, Buff Ermine, Silver Ground Carpet or maybe a Beautiful Golden Y. Also day flying moths are attracted to your garden and Silver Y, Hummingbird Hawkmoth and Diamond backed Moth are sometimes seen feeding on flowering plants. 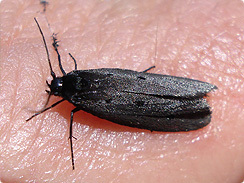 If you are a beginner at moth identification there is a great web site at http://ukmoths.org.uk/ and it has a beginners Top 20 and is a great help. 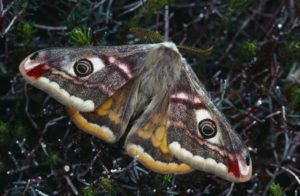 Emperor Moth. Image by Laurie Campbell. Other things to look out for are Hawkmoths which are the largest and most striking moths. There are nine resident Hawkmoths in the British Isles and a further 8/9 migrants. The commonest are Large and Small Elephant Hawkmoths, Poplar Hawkmoth, Lime Hawkmoth and Eyed Hawkmoth. A rare and elusive moth has been re-discovered in the Highlands…..
Its always good to hear about wildlife surviving in this day and age of mass destruction so this find in Scotland is even more amazing. Ethmia pyrausta. Image by M Currie. The black winged and orange bodied Ethmia pyrausta was first recorded in the Shin Valley in 1853, and must have survived unseen in the area ever since. At a Moths Count training session at Aigas Field Centre in Inverness-shire, Andy Scott and Margaret Currie produced pictures of a moth for identification. Workshop leaders, Mark Young and Roy Leverton, instantly recognised it as the fabulously rare Ethmia pyrausta, an almost mythical species of the Highlands. Apart from the original 1853 specimen, only four others have ever been found in the UK. Two were found in 1996 on the top of Glas Maol in the Cairngorms with a further two since found nearby. The caterpillars have never been found in Britain. This one was rescued from a spider’s web near Loch Morie – close to the site of the 1853 sighting. Previous to this discovery, there were doubts that the species still lived in The Highlands at all. I hope that this article gives you enough of a starting point to get out and have a look for some butterflies and moths yourself, good luck and happy hunting! Andrew is a self employed Field Ornithologist with an interest in Butterflies and Moths. He specialises in moorland bird surveys and environmental impact surveys for windfarms. He can be contacted via his email address – andrewcockroft@talktalk.net.